Medical care, whether it is sick care or prevention and wellness care, is in desperate need of new business models. Most physician entrepreneurs have a hard time describing a business model, let alone creating new ones. They are not alone. As noted before, everything from digital health, to Commoditycare, to Othercare, to medical travel needs a new business model to sustain it. I like the definition that a business model describes the rationale of how an organization creates, delivers, and captures value. In other words, where and how it does things to create a profit. Business models are constantly changing to adapt to customer needs and technology. For example, Daily Burn, a subscription service that offers hundreds of video exercise classes for $15 a month. Why do to the gym? Targets in the cross hairs are commonly brick and mortar structures and service intermediaries that can be eliminated or supplemented. Channel change is happening in sick care using telemedicine, apps, house calls, diagnostic vans and streaming services. Here are 14 essential links to working with the business model canvas. The present medical business model is riddled with inefficiencies, perverse incentives, pricing problems, third party intermediaries and multiple stakeholders that result in about 1/3 of medical spending being wasted. Patients are frustrated and doctors are angry. It’s time to take a page out of other industry’s play book, and create new business models for medical care. Concierge medicine, a direct or pre-pay model, has grabbed a lot of attention, but there are many more, as noted in this HBR post. 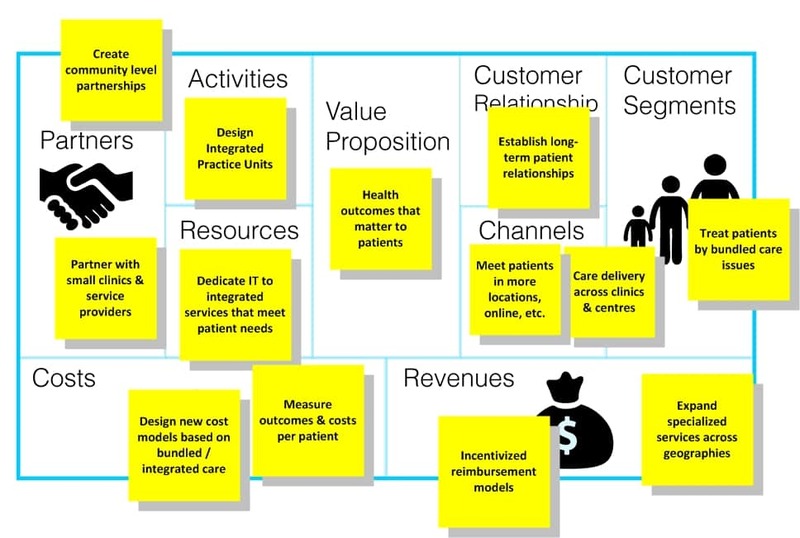 Here are some examples of medical practice business models that are in response to change. Pharma and Medtech business models are changing too. Telesickcare is searching for the right way too. Another option is to change services into products. Rules drive ecosystems. Ecosystems create business models that sustain innovation. If we want new business models, we’ll need to change the rules.